Alltid veldig hyggelig å besøke Clara Og André på Bodegas Bentomiz. Her er noe av det de skrev om oss i sitt nyhetsbrev på Twitter. 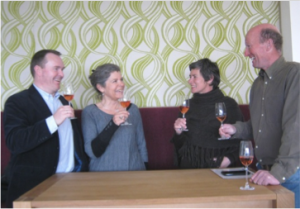 Caroline and Stein of Sonnavin, our Norwegian distributors, visited the Bodega this month. They are very positive about their progress. All our wines are available through the State Monopoly.The State Monopoly shops carry about 750 wines, which are described as either innovative, of limited availability or of an exceptionally high quality. Since we believe all three are true of our wines, we were not entirely surprised when Stein told us that the Ariyanas Naturalmente Dulce has been added to the stocks in the shop in Oslo. We are delighted, though: given the restrictions imposed it is not an easy market to break into. The best shop for wine in Oslo – and possibly in the whole of Norway – is the Monopoly’s shop in Vika, which we are now in.